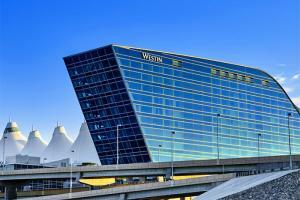 This modern hotel is a convenient destination for leisure travelers at Denver International Airport. The hotel is part of the new Hotel and Transit Center, which also comprises an outdoor plaza and a public transit center with rail service to downtown. With 519 soundproof guest rooms including 35 spacious suites, the Denver airport lodging features panoramic views of downtown, the Rocky Mountains and the airfield. This convenient destination is perfectly located for leisure travelers at Denver International Airport. Sky Lounge - Cocktails; Grill & Vine - American cuisine. Denver Zoo, Elitch Gardens Amusement Park, Colorado's Ocean Journey, Denver Wildlife Experience, Winter Park Ski Resort, Beaver Creek Ski Area, Aspen Mountain Ski Area, Denver Museum of Nature and Science.